At the end of the 20th century, mainstream economics was based on theories which viewed capitalism as a self-regulating system, whereby crises come about due to external shocks and would be automatically corrected by the price mechanism if it was flexible enough. Post-Keynesian economists, however, consider that the business cycle and the crises are endogenously generated. They recommend active policies as a response, though the remedies may be worse than the illness if they are not applied at the right moment and in the right proportions. The first great recession of the 21st century offers post-Keynesian economists an opportunity to prove the realism of their models. It is also a chance to make theoretical improvements, to abandon some hypotheses and to introduce new ones. 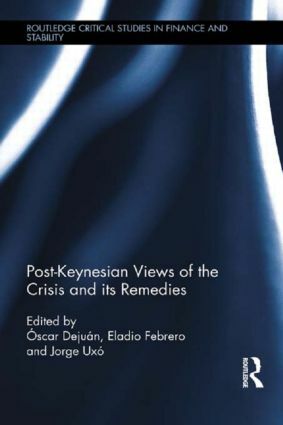 This book, from a top group of international economists, analyzes the causes, consequences and evolution of the crisis from a variety of post-Keynesian perspectives. It then presents a case for realistic and essential remedies. The book is both theoretical and applied, with a global reach and a particular focus on the European debt crisis.